Grammy Award winning artist Jennifer Montone is the Principal Horn of the Philadelphia Orchestra and an internationally acclaimed soloist and chamber musician. Ms. Montone has performed as soloist with the Philadelphia Orchestra, the Saint Louis, Dallas, National, and the Polish National Radio Symphonies as well as the Warsaw National Philharmonic. Her recording of the Penderecki Horn Concerto,"Winterreise" with the Warsaw National Philharmonic won a 2013 Grammy Award in the category of "Best Classical Compendium". As a chamber musician Ms. Montone is a regular guest with the Chamber Music Society of Lincoln Center, Santa Fe Chamber Music Festival and the Bay Chamber Concerts. She has also been a guest of the Marlboro, La Jolla, Spoleto Italy, and the Lake Champlain chamber music festivals. As a soloist and chamber musician, Ms. Montone has enjoyed collaborating with artists such as Emmanuel Ax, Eric Owens, Christoph Eschenbach, Shmuel Ashkenazi, Joseph Silverstein, and Raphael Fruhbeck de Burgos, among others. Ms. Montone Joined the Philadelphia Orchestra as Principal Horn in 2006 and previously held the same position in the St. Louis Symphony. 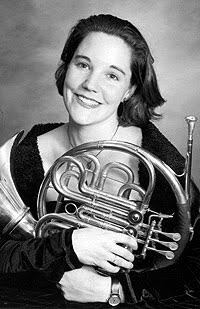 She was the Associate principal Horn of the Dallas Symphony and held the position of Third Horn in the New Jersey symphony beginning during her years as a student at the Juilliard School. As a leading pedagogue, Ms. Montone is a member of the faculty at the Curtis Institute of Music as well as her alma mater, the Juilliard School. During her tenure in Dallas, she was a member of the faculty at the Southern Methodist University. While at the Juilliard School, Ms. Montone was a student of Julie Landsman, legendary pedagogue and Principal Horn of the Metropolitan Opera. Her influential teachers also include Edwin Thayer, Principal Horn of the National Symphony Orchestra. In May 2006 Ms. Montone was awarded the prestigious Avery Fisher Career Grant. She is also the winner of the 1996 Paxman Young Horn Player of the Year Award in London.